At Adem & Havva Hair transplantation center, we have been performing PRP therapy as a proactive therapeutic option for male and female patients experiencing hair loss. PRP is an exciting non-surgical therapeutic option for patients who require stimulation of hair growth for hair loss conditions. Recent scientific research and technology provides the medical community with new understandings of wound and tissue healing. As a result of these scientific studies, we know PRP is an all-natural medical procedure performed in physicians’ offices for hair loss or conditions causing hair thinning. Human blood contains mesenchymal stem cells and autologous blood products that contain essential and specific growth factors that assist in tissue regeneration and healing. Published medical literature from Europe and the United States confirms the safety and use of PRP therapy. In the field of hair restoration, existing evidence demonstrates PRP therapy as a promising treatment option to promote hair growth. HOW DOES IT PERFORM THE PROCEDURE? Blood is drawn in our clinic as though you are having routine blood testing. Blood is spun in a centrifuge and the PRP is separated and removed from the rest of the blood.The PRP is taken from your body and is specially prepared by spinning down the blood cells to a high concentration. After centrifugation, the platelets and other vital growth proteins raise to the top of the tube. Under a topical anesthesia, a special micro needling roller device is used to stimulate the dermis of the scalp. This micro needling stimulation causes microtrauma to the dermis that induces other healing and growth repair cells into action. The highly concentrated platelet rich plasma (PRP) is then injected into the scalp and topically. 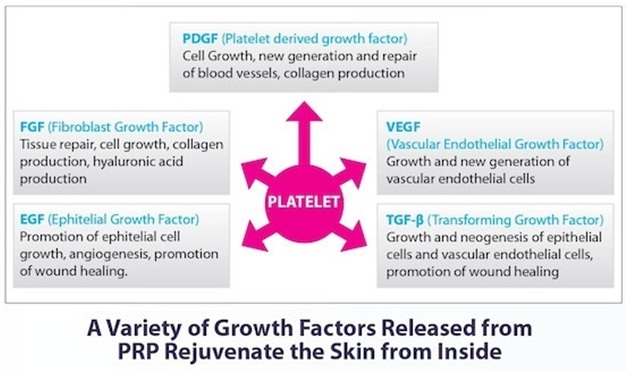 The PRP contains many growth factors that stimulate the hair follicle’s growth. PRP can be used preoperatively, intraoperatively, or post operatively. Some patient’s chose to have PRP performed every three (3) to four (4) months as early data suggests regular or semiannual PRP treatments can stimulate hair growth.